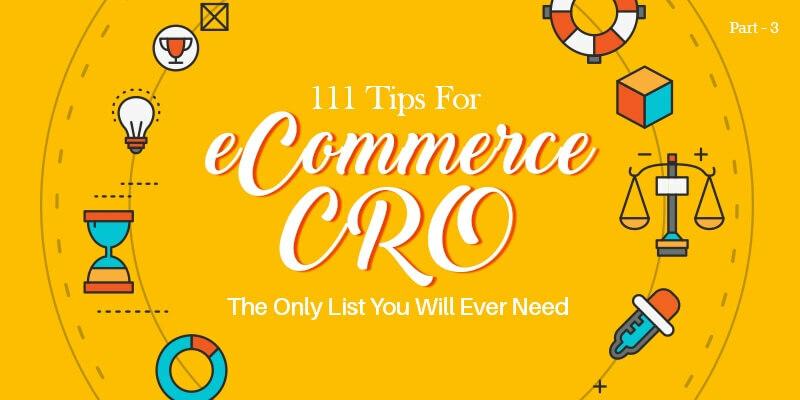 Hope you have put the 67 valuable points from the part 1 and part 2 of our 111 Tips For eCommerce CRO to good use! This post is the final installment of the series and will concentrate on bringing the right users and incentivizing them to purchase from your online store. Let’s get started! When customers were asked “What they feel is an important element of good customer service,” 52% stated that they wanted an easy way to access information. This means making customer support important is a must for all eCommerce businesses. If you are wondering what customer support has to do with eCommerce CRO, well, a Forrester study showed that 45% of U.S. shoppers abandon their cart if their concerns are not solved quickly. That’s not all, 91% of customers who leave will not visit the same eCommerce site after a bad customer support experience. You would have probably read this data a million times, but we can’t be without emphasizing on it enough. A 3+ second delay would make your customers leave your site, never to look back. As the eCommerce evolution continues where there are over a million websites trying to compete against one another, personalized marketing comes into play to give you the much needed push. Social media is a great portal to connect with customers in real-time. It’s also a great place where you can easily promote your product and services to prospective buyers easily. If you are wondering how effective social media is with respective to conversion – It accounts for 0.71% of total conversion. Campaigns are the main driving force that brings relevant traffic to your website. To improve your eCommerce website’s SEO, it’s important that you start running targeted campaigns that brings in the right traffic. Acquiring a new customer cost 6 times more than retaining your existing ones. Gaining loyalty is the only way to improve customer retention, as well as your eCommerce conversion rate. Optimizing your eCommerce UX and marketing campaign alone won’t bring the necessary traffic and conversion, other important elements need to be considered for improving your site’s visibility. A live chat helps customers connect with you instantly from your website. By having an active live chat, you not only help customers resolve their grievances faster, but also provide the right platform to enhance the trust and loyalty needed to improve your eCommerce CRO rate. Compared to the other customer support options, 73% of customers feel live chat is the most efficient one. If both the above happen, then you’ve lost the potential customer forever. This is closely related to our previous point. You must have strict Customer Support policies and good infrastructure to ensure customers can reach you effortlessly. Your customers hate to be on hold. Sometimes it’s inevitable, but ensure someone gets back within 30 seconds. Your customers will appreciate the honesty and politeness, which aids in the easy transition from a casual buyer to a loyal customer. It’s important that your entire customer support team is armed with the right information to satisfy customers. By creating a comprehensive list of customer queries along with the best responses, you can provide quick support to your customers. Most customers reach out to customer support only when they come across a critical issue on the website. Being sympathetic is the quick way to calm them down instantly. Even if the issue/problem is not from your end, it helps to provide a friendly ear to their concerns and let them know exactly how you are going to handle the situation. The fact is, not all customers are right, there are quite a few who would try to take advantage of good customer support. The key is to be sympathetic and not lose your cool. Nothing can be worse than a silent customer support. As soon as a customer sends a mail, an automated response becomes mandatory to let customers know that their message has reached you and it will be taken care as soon as possible. If customer’s don’t get a response, they instantly perceive it as a problem with ‘bad customer support’ and will not return to the site, thereby leading to poor CRO. Broken links are big page speed killers. When the page tries to load these links, it slows down your website. Do a regular audit of your website to eliminate any broken links. If you have an eCommerce website with many high resolution pictures and interactive elements, then content delivery network is essential to bring down your overall page load time. The CDN has the same content stored on multiple servers, leading to better content delivery when the page’s API is being called. Responsive websites help you to have a consistently good UI across all devices. There are many websites that resort to having m.<domainname>.com. Such mobile pages have a separate set of optimization techniques. To reduce the amount of time spent on optimizing for each platform and device, a responsive design helps by providing a constant UX to users. Comprehensive testing should be followed for your eCommerce website. Statistics state that customers are proactively shopping on mobile devices. Even if you have a responsive website, it’s best that you test your website on multiple devices of all screen sizes and mobile OS as you cater to different customers. User experience is an element that reflects your brand’s voice and personality. It’s extremely important to be consistent with how you portray your brand. Your branding strategy will be successful only when customers are able to recognize it across all devices and platforms. Only by establishing a brand for yourself, will your eCommerce CRO get the necessary boost it deserves. This is a great tip, as your code can automatically set the image for the desired dimension. Thus, You will always have optimized images for your website on any device. Caching is a great way to improve your page load time for repeat customers. Once the cache is enabled, your site’s cookies and images are stored in the user’s browser history. This helps reducing the page load time when they return to your website. This greatly improves your eCommerce CRO because repeat users get better experience and will convert more. Running a promotional campaign? Then expect a huge peak in traffic! Your website should be built to withstand any amount of traffic. Peak times (Such as holiday sales) will require you to temporarily increase your server space to provide seamless shopping experience to your eCommerce customers. Protip: Get a full time tech support to assist you during your busy eCommerce hours. An average B2C eCommerce store could have anywhere between 500 to 2000 products and your customers are not going to browse through each and every one of them. Having a recommendation column on all pages with products previously visited by the customers will help them revisit it and improve the conversion rate greatly. When you can further curate the user’s browsing history, there are more than a few things you can find about your customers, which can be used to get better conversion. For any B2C portal with a large mailing list, newsletters/mailers are the best revenue generating medium. Imagine if you can personalize these newsletters with the products of interest to users; you are guaranteed to have increased clicks and ROI. Creating such personalized mailers are easier than you think. Segregate your users based on the various categories they have purchased from and split the database. This helps you in showcasing the right product to the right audience. Protip: To do this, we recommend Targetbay– A great personalization/segmentation tool. Amazon has the “Recommendations for you in … “ sectionon their home page and it’s always based on the products one has previously purchased/viewed through them. This greatly improves interaction on page as customers tend to revisit items again. If you sell everyday essentials through your eCommerce website, then a renewal reminder email is a great eCommerce CRO technique. Also, ensure these emails have a one click purchase link right through the email and an additional discount coupon-your users are sure to appreciate you for this thoughtful gesture and convert instantly. Incentivizing your customers who haven’t visited your site in a while is a great way to get them back. A win-back email campaign helped Marketing Sherpaget 8.33% of CNET’s dormant users back to their site. The numbers state that 70% of your eCommerce visitors are likely to convert through retargeting ads. These ads make use of user’s cookies and display products of their interest. Including social share icons in each product page helps customers to easily share the products they like through their personal social profiles. This is the simplest way to reach out to more number of potential buyers through one existing customer. Incentivize customers to talk about you and your product. Run a competition for videos reviewing one of your products – This will help you get the desirable reach among your target audience and get you customer reviews to showcase on the site! Having an active social profile is extremely important and still ranks as one of the best online influencer. To check the reputation of your brand, your social profile is the first place your customers will look at. Make use of your social media profiles to share your latest promotions and offers. Also share interesting information about your products and services to increase the number of followers. Facebook is also a great platform that lets you buy products directly through them. It’s the best place to generate more targeted traffic back to the website. Social media ads are designed to be targeted and cost-efficient, making it the perfect tool for online entrepreneurs. You can experiment by advertising at various times during the day to your target audience. You will soon find the right time to target users that generate maximum traffic and conversion. An average customer spends 30 minutes online browsing through their social media profile. This makes social media the easiest platform for them to connect with you. Plenty of companies provide twitter and Facebook support pages to easily let customers interact with them. The major drawback is that the social profiles are an open platform, so any blunder you make becomes evident to all your followers. The rule of thumb is that you respond courteously to all your customer’s concerns and queries. If any complaints are raised, immediately start an offline conversation to move the customer communication out of the public forum. For all eCommerce websites, a good email list is important for running a successful marketing campaign to improve CRO. Sign up bonus, referral bonus and plenty other easy incentives can be given to customers to build your email list effortlessly. Even a simply CTA that states ‘get the best offers delivered straight to your inbox’ will have better traction in building your eCommerce email list. Having the right content is important for all online stores. Since customers do not get to touch and feel the product,they resort to buying online because they feel they can get a good deal or they do not have the time to go to the physical store. Whatever may be the reason, you only have a few seconds to impress your prospective customers. Get creative and craft the right content that has all the best elements to create the necessary ‘sense of urgency’ and the product description that makes the customer feel that they ‘must have the product’. Try A/B testing with a different set of messages to check which content has a better response rate to improve your eCommerce CRO. Regular newsletters/mailers are important to bring necessary traffic to your website. The traffic generated through these mailers are more likely to convert, as they are the opt-in customers who know about your product and services. Ensure your emails are personalized with the right content and product to make customers convert. Also, remember not to flood users with emails with just your products. This will irritate customers and make them unsubscribe. Ensure you send some valuable information to users to improve your open rate. A promotional calendar helps plan out your campaigns efficiently. It should contain the dates of all the important days and which ones you are looking to target. Once you have pinned down all the offers and promotions, it’s easier to schedule the campaigns in advance to have a structured marketing activity. Also, you can understand which promotions and which season brings in more eCommerce sales and conversion. Flash sales are the ones that don’t come under your promotional calendar. These kind of sales will run for a very short course of time and usually at the end of the month to improve the overall ROI of the month. These sales have high eCommerce conversion because they create the necessary sense of urgency amongst your customers. A campaign with specific goals/target is bound to bring in better conversion than generic massive campaigns. Let’s assume you want to run a ‘back to school’ campaign, then select only the specific set of products and market it to the right audience (i.e students and parents). This will reduce your marketing cost greatly and improves ROI and conversions. A loyalty program is a great way to help customers keep coming back. Such programs ensure that customers are rewarded for shopping with you regularly. A policy where ’loyal shoppers always have X% discount’ will help in building the number of a loyal customers. Credits for each purchase is another great way to keep bringing in customers. These credits could further be used to buy products from your store. If you notice that a customer has made more than three transactions in a month, thank them by sending a mailer along with an additional discount coupon. They are bound to make another transaction and drive up your conversion rates. The Google trust badge easily lets shoppers identifies your store as trustworthy and one that provides excellent customer service. It never hurts to have more number of trust badges on your website, it only leads to improved conversion rates. Plus, it’s free to enroll. If you run a B2B company, especially selling machines, invest in producing high quality intuitive videos that highlight your product’s key features. This gets you the necessary visibility and recognition needed to get your product to the end user. Usability testing done by your testers might bring out the technical bugs, but to improve the usability features, testing should be done by your target audience. It’s their perception of the website that matters the most. You can easily discover such usability bugs and improve your eCommerce navigation and functionality. Testimonials and reviews from other customers are some of the trust enhancing factors of a website. Find a prominent place on your homepage to showcase it to your users. Make use of social media also to connect and thank users for their kind words. This will get you the necessary attention and publicity for your testimonials. The meta title and description fields are extremely important for SEO, helping products rank better in search engine results. Make sure you strategically place the keywords in both these fields. Wishlists are a great way to not only get your users engaged, but also their friends and family. Encourage users to build their wishlist and, in turn, their friends will have to buy through your website. One of the biggest advantages of running an online business is that you have all the necessary data recorded to aid in your continuous improvement analysis. Do a thorough analysis of your eCommerce process and try connecting with your existing customers to improve your service better. Through continuous improvement, you can find more products you can sell and also identify new target audiences. If your sales are stagnant, this is the best way to expand your reach and thereby improve your conversion rate greatly. Running out of stock and stopping the sale of a product becomes inevitable at some point of time. To avoid losing customers, you can’t remove the page as it would have been indexed by search engines. So ensure, you mention the product is out of stock and redirect users to a relevant product. This helps them find the product they need in your website rather than abandoning you to shop with your competitors. Phew! What a list! We hope you enjoyed our 111 tips that can easily boost your eCommerce conversion rate. Need help in implementing these Magento eCommerce CRO tips? Contact us at [email protected] or send us a tweet @TheCommerceShop.